We focus on high-quality Limousine and Chauffeured transportation. You are welcome to visit our office and convince yourself. Also see our most recent customer testimonials. For your convenience we have quick & easy processing. Also we carry a proper passenger insurance. Our Chauffeurs are background checked professionals. Stand out & enjoy your time of traveling. Your chauffeur will treat you like a VIP. Our top notch vehicles are comfortable and stocked with drinks & snacks. Most vehicles have a privacy partition. Limotions is located in Ft. Myers/ Cape Coral. Therefore we are specialized in quick response RSW Airport Transportation services. Short notice reservations around this area are welcome. Call or mail us directly or easily book thru our online reservation system. Fort Myers Airport Limo Book Now! Whether it’s an exciting Sporting Event, a rousing Concert or a beautiful Theatre performance don’t worry about traffic and parking. Trust instead your TOP Fort Myers Limo service and ride in style. It’s a once-in-a-lifetime Experience... It remains forever in your mind... It is your Wedding! Completed with one of Limotions beautiful decorated Limousines even the transportation gets memorable. Limotions satisfies your corporate travel needs. Regardless if it is a business travel, a trade fair show or a special client treatment. We always ensure professional and discreet Limo and Bus service. With different package options your Limousine becomes your mobile workspace. 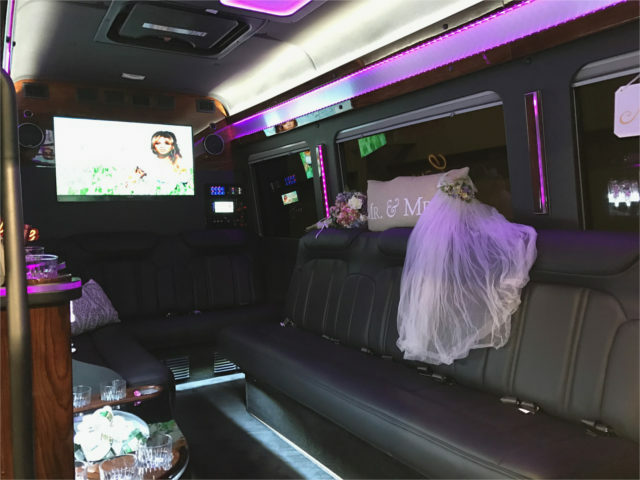 Wedding, Birthday, Prom, romantic Sunset & Dinner, a Night in Town, Valentines Day - no matter what - every special day should include a stretch Limo. Enjoy every minute of your occasion while Limotions does the driving. Limotions Limousine is proud offering you premier Naples, Punta Gorda car service, Cape Coral and Fort Myers Limo service since 2006. We carry an elegant fleet including late model luxury Mercedes sedans, timeless stretch Limousines, stretch SUV’s and also Party Buses and Limo Buses. Whether it's your Limousine to a Concert, your Wedding Limo, a Bachelorette or Bachelor Limo Bus or Airport car service - we go the extra mile to transport you in comfort and style. You are traveling beyond the border? Limotions is Global. Our brand logo highlights special deals and recommendations. We are also offering selected packages to make it a complete one-stop-service. Ask upon your reservation. MOST RELIABLE LUXURY FORT MYERS LIMOUSINE SERVICE! Make your Wedding 2018 really special! Book your Limo now and get a FREE bottle champagne! Limotions, Ft. Myers & Naples Limo service proudly provide: of course Ft. Myers Limousine & Ft. Myers Beach Limo & Party Bus, Limousine to Cape Coral and Sanibel, Naples Limousine service and Marco Island. Furthermore, Limousine service and Party Bus & Limo Bus service to Miami and Ft. Lauderdale and Limousine service to Tampa. But also surrounding areas like Port Charlotte Limo, Sarasota Limousine, Miami Beach and stretch Limo & Party Bus to Punta Gorda and Cape Coral Limo service.